The web has been abuzz over so-called "kosher Coke," the special kosher for Passover edition of Coke that is sweetened with sugar rather than high fructose corn syrup (HFCS). Because HFCS is made from corn, it is prohibited during the Jewish holiday, so Coca-Cola bottles a version of the soft drink made with sucrose. Off the Broiler blogger Jason Perlow has been the Internet's primary resource on the subject, updating and annotating a 2006 post with instructions on how to identify the soda and where to find it. I'm not much of a soda drinker, but I was curious about how the stuff tasted, so we headed over to Kew Gardens Hills, which boasts a major Orthodox Jewish population. At Wasserman's supermarket, we found a rack of 2-liter bottles topped with the distinctive yellow caps marked "OU-P" that distinguish them from ordinary HFCS-sweetened Coke. Once home, we held a soda smackdown. The results: a draw. As I mentioned, I'm not a huge soda fan (so take this with a grain of salt), but I could not distinguish a major difference in the flavor of the sucrose-powered Coke. I wanted it to be great, but the two versions tasted pretty much the same. If I could discern anything, the kosher Coke had less of a "finish," whereas its HFCS counterpart's sweet flavor lingered longer on the tongue (for better or for worse). It also seemed less carbonated (which I liked), but this may have been a peculiarity of the particular bottle we took home. Overall, I was underwhelmed. Have you tasted kosher Coke? What do you think? Good, great, or not worth the hype? Grab a drink and get a nose job. Pick Your Nose party cups come in 12 different combinations of nose, mustache, and dental work: "A must for your next party, and the perfect gift for any plastic surgeon who loves to do rhinoplasties." $18.75 for a pack of 24 cups at The Spoon Sisters. Barista Amanda Byron will lead this tasting and discussion about the history of coffee, coffee origins, and brewing techniques and processes across cultures and eras.Attendees will taste and compare Turkish, percolator, vacuum, French press, drip, Chemex, moka pot, and instant coffee, along with espresso. 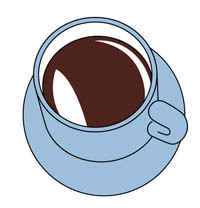 The class will take place on Thursday, March 29, 8:00 p.m., at Joe The Art of Coffee, 9 East 13th Street. $10/person (register by contacting gabrielle@joenewyork.com). Most baby utensils are made of plastic (excepting these high-styled Danish models), but bambu's cutlery for babies and kids is made of renewable, organically grown bamboo (the company also makes a starter cooking utensil set for gastronomes in training). The lightweight, dishwasher safe cutlery retails for $9.95 (baby) and $5.95 (kids) at greenfeet. 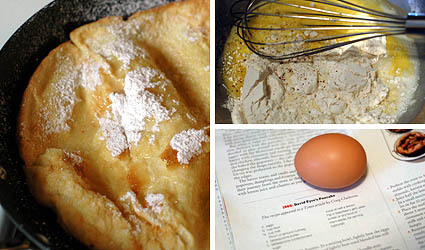 Back in April 2005, I wrote about the David Eyre's pancake, which was the subject of Amanda Hesser's "Recipe Redux" column in this Sunday's New York Times Magazine. In the Times piece, Hesser revisits the 1960s era recipe -- quite possibly my favorite sweet breakfast treat -- and asks chef chef Ana Sortun, of Oleana in Cambridge, Massachusetts to recast it for the 21st century (it becomes the inspiration for a savory chicken popover). My grandfather is David W. Eyre, who 'made up' the recipe (he admits that he combined a couple of other pop-over and german pancake recipes). He's 94 years old now and doesn't know much about the internet, but was THRILLED to read all the comments about the pancake on this site when I printed it out for him. How exciting that people were still making this delicious thing -- and having such a sweet connection to his name! In our family, we still eat it a few times a year -- but my dad is the main chef now. When I was a little girl, my dad told me that the recipe was secret and only passed down to the male members of the family (he probably said that to my ruffle budding feminist feathers!). After three girls, a boy was finally born and my pop said "Thank heavens, the recipe will survive!" But by then, I had seen and copied down the framed copy of the NY Times recipe framed in my grandfather's kitchen... Warm aloha from Emma. The annual benefit for the Center for Book Arts will feature edible books created by artists matched with chefs from the French Culinary Institute (the theme of last year's benefit was "Books That Kill: Edible Mystery Thrillers"). This year's event will take place from 6:00 p.m. to 9:00 p.m. on Thursday, April 5, at the Center for Book Arts, 28 West 27th Street, 3rd Floor. Tickets start at $75, raffle tickets at $10 (212.481.0295). 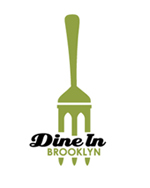 Restaurants participating in "Dine in Brooklyn," the borough's fourth annual restaurant week, will offer three-course dinners for $21.12 from Monday, March 19, through Friday, March 30. For more information, including a list of the 175 eateries offering the promotion, visit visitbrooklyn.org. 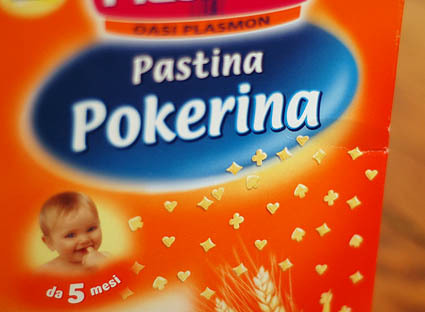 Scrounging around the cupboards this weekend for something to cook Anya for lunch, I came across a box of "Pokerina" pasta which I had picked up on my last trip to Italy. I can't imagine you would ever find this pasta shape sold in America, where gentle, benign stars and alphabets rule the day in the realm of miniature pastas. But, there it was on the shelf at the farmacia, and I took some home as a souvenir. 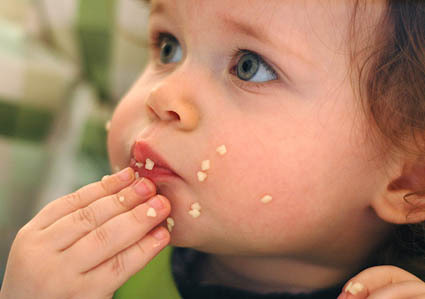 At 17 months, Anya has thrown off her pasta training wheels for some time, graduating to advanced noodling -- rice vermicelli, penne, spaghetti, spirale, fusilli, and orecchiette, among myriad other shapes. But, she still enjoyed these gambling-inspired morsels mixed with butter and grated Parmigiano-Reggiano, even if they left her with a bit of a poker face. Ba-dum-dum.